You save $19.08 on quantity of 6 bulbs over �each� price on this variety. Spicy fragrance, 3 to 4 Feet. Late July /Early August flowering. Pinkish-white, with a slight pink trim on the petal edge upon opening. 'Anouska' has taken the place of 'Miss Lucy' in our fields as we have found her to be superior in the garden. This delicate shading does not show as well during very hot weather, so we recommend afternoon shade or all-day dappled sun for gardens in warmer climates. Cool summers below 80F, full sun or light afternoon shade is fine. 3 to 4 Feet. Late July / Early August Flowering. Sweet Fragrance. 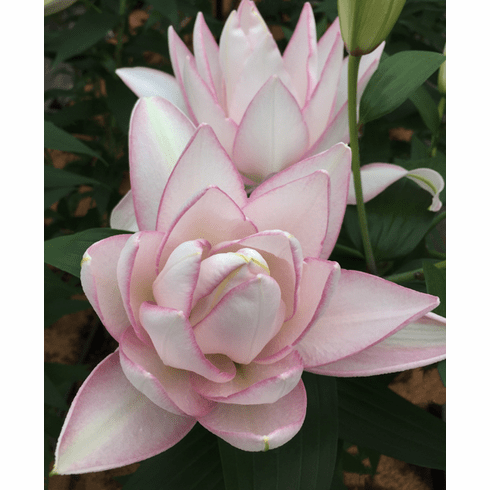 Bulb Size - Our standard for bulbs of this Oriental Hybrid Lily Bulb cultivar ranges from Premium-size (16/18 cm) to Exhibition-size (over 20 cm).